Looking out the windows of the second-story Trama gallery at the Taller Experimental Gráfica de Guatemala, the view is of a telephone company across a congested 7th avenue. Informal money-changers line the street below, offering the day's rates for dollars or Euros. The gallery is in a commercial center and apartment building, and, situated in a passageway above the building's public entrance, it has noticeably few walls. Instead, the windows are its defining feature, and connect it to its site in the heart of this noisy and unpredictable city. This summer, Dominican-born artist Karma Davis placed vinyl transfers over the windows, opening up the gallery's relationship to the activity, below. Davis's martial-arts inspired graphics seemed to tumble through the air, their cosmic fights linking inside and outside in a fantastic melánge of color. Following Davis's precedent, Comalapa-based artist Edgar Calel's exhibition at Trama also uses the windows as a space-between. 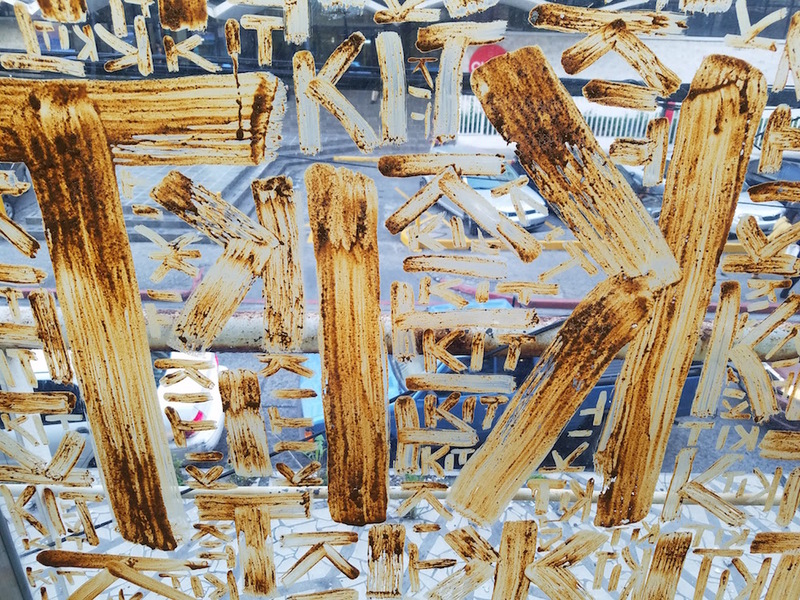 On the windows, he paints the words Kit kit kit kit over and over in red clay on the glass. The words replicate what he has painted on the street-side wall of his studio in Comalapa, a space he named Kit kit for the birdsong his grandmother would make as she walked the interior garden there. To paint with clay, Calel says, is to think about words floating away on the wind, to allow for ephemerality, to embrace time as an ever-moving thing. In Comalapa, the mud-painted words will gradually fade from the walls, washed away by rain and wind and time. In the city, of course, they will be washed away much sooner. In his work, Calel has consistently thought about bridging different places and communities; with this painted window, the words Kit kit kit form the outline of the mountainous landscape of Comalapa. Much like his contribution to the 19th Paiz Bienal (in which he brought stones from Comalapa to the city), Calel makes visible the rural place that is the center of his practice, and he does so in the epicenter of a city that is eager to erase its connection to the fields, towns, and people outside it. Look through the mud, through the bird song, through the mountains of Comalapa, and you might barely make out a telephone company building, money-changers, a phalanx of traffic slowed to an impatient stop. An inveterate wanderer, Calel is as likely to turn up unannounced at my home early Saturday morning as he is to appear on a bus in São Paulo or among the archaeological sites scattered across Guatemala. He seems to be always everywhere. He is strikingly gregarious and generous with ideas, eager to talk about dreams, about art, about the world he wanders and its many myths and stories, about where his feet lead him and what he finds there. The exhibition El rostro de la tierra que mis pies vieron (The face of the land that my feet have seen) takes Calel's 2014 visit to Brazil as its subject. Traveling among guaraní kaiowa communities along the border of Brazil and Paraguay, Calel carried many-colored seeds of maize, herbs, and squash with him as a gift for his hosts. "Yo tenía muchas ganas de guardar en mi memoria ese momento que habia presenciado. Conservar ese tiempo y su atmósfera, junto a sus tonalidades de colores, era un deseo," he writes. ("I very much wanted to remember this moment, to preserve this time and its atmosphere, along with its tonalities of color, that was my hope.") A simple defiance of contemporary regulations against carrying fruits and vegetables, seeds, and live animals across international borders, Calel's gesture is rooted in the importance of agriculture and landscape in his community's philosophy, quotidian life, and extensive history. "Pensé en las semillas, en las personas que habían muerto por retomar sus tierras y volver a vivir de la manera como se vivía antiguamente," he writes. ("With the seeds, I was thinking about the people who have died for taking back their lands and returning to live in the manner that they lived in ancient times.") In exchange for the gift of the seeds, the guaraní kaiowa community he was visiting offered him a gift of thanks as well: standing barefoot in the area's reddish soil, they stepped (laughingly) on page after page of Calel's notebook, leaving their footprints (and the footprints of a pet dog and a pet monkey) for him. These pages hang on the wall at Trama, near a video of their making. Watching children take turns stepping on Calel's pages, one gets the sense of a dance unfolding, of what a sincere and innocent trust looks like. These footprints are not only portraits of their makers, but they are also registers for a moment in time marked by the experience of sharing: food and drink, story, dance, laughter. What Calel has made is no small thing: it is, perhaps, the most radical act we can make to trust another person enough to share our path, our very footprints in the earth, with him. To understand that our roots are vibrating in our face when a soft wind touches the pools of water the rain left behind, where we see ourselves reflected," he writes. *Trama is a non-profit gallery at the Taller Experimental Gráfica de Guatemala in Zone 1, Guatemala City, coordinated by Mario Santizo. A limited-edition series of four prints by Calel are available for sale to support the exhibition.